On occasion, you may need to access an endpoint to change settings in the SecureAnywhere interface. This might be necessary if you assign an endpoint to the Unmanaged policy, which is not controlled through the Management Portal. Note: For complete instructions on using the SecureAnywhere interface on the endpoint, see the WSA PC User Guide. For Mac computers, see the WSA Mac User Guide. Right-click on the Webroot icon from the system tray menu, then click Open. If the system tray icon is hidden, open the Windows Start menu, click All Programs (or Programs), Webroot SecureAnywhere, then Webroot SecureAnywhere again. The Overview panel opens, similar to the following example. Along the right side of the panel, the main interface includes navigation tabs. PC Security Run custom scans, change shield settings, and manage the quarantine. Identity & Privacy Protect sensitive data that may be exposed during online transactions. Utilities Use tools to manage processes and files, view reports, and submit a file to Webroot Support. Also use the System Optimizer to remove Internet browser activity and to remove temp files. My Account View SecureAnywhere account information and check for updates. Support/Community Access customer support and the Webroot Community. To display the main window, click the Webroot icon in the menu bar. 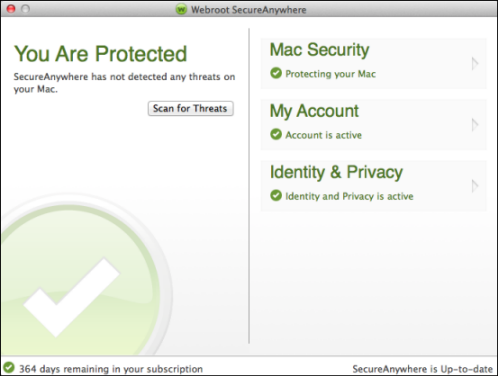 Select Open Webroot SecureAnywhere from the drop-down menu. When your system is secure, the main window looks similar to the following example. Green. Your Mac is secure. Yellow. One or more potential risks require your attention. Red. One or more critical items require your intervention. The following table describes the drop-down menu items under Webroot SecureAnywhere. About SecureAnywhere Shows the SecureAnywhere version number. Preferences Allows you to change system preferences, scan schedules, and other settings. My SecureAnywhere Account Shows your keycode and other account details. Check for Updates Downloads and applies the latest program updates. 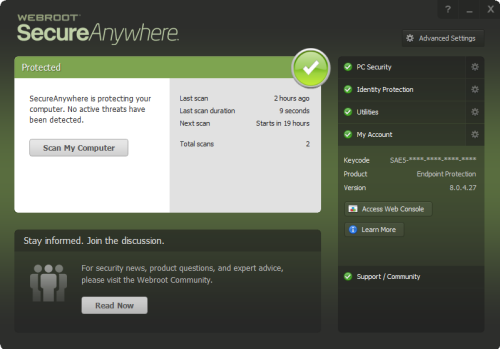 Hide Webroot SecureAnywhere Hides the main window, but does not shut down SecureAnywhere protection. If you want to shut down protection, click the Webroot icon in the menu bar and select Shut Down SecureAnywhere. The following table describes the drop-down menu items under System Tools. System Control Allows you to adjust the threat-detection settings for all programs and processes running on your Mac. Reports Allows you to save a scan log, which might be helpful if you are working with Webroot Support to determine the cause of a problem. Submit a File Allows you to send the file to Webroot for analysis.You might want to submit a file if you think it's causing problems or if you know it's safe and want it reclassified. System Analyzer Provides a simple utility for locating threats, security vulnerabilities, and other computer problems. The completed report recommends how to increase system performance, privacy, and protection.